"VIVEO, THE WHITE FIRE ANGEL OVER-LIGHTING SOULS"
Beloved masters, once again, I welcome the opportunity to blend with your higher consciousness, to fill your Sacred Heart and Soul with the Divine love of our Father/Mother God. It is always our greatest desire to inspire and comfort you and to guide you along the path of higher awareness, which eventually leads to Self-Mastery. At this time we wish to apprise you of what is transpiring during this momentous year we are calling the year of the GATHERING OF SOULS. My intention is to reinforce the concept of telepathic communication between you, the STAR SEED, the Cosmic Council of Light and we of the Legions of Light within this Sub-Universe. It is important that you feel with your inner senses, and validate from within your Sacred Mind and Sacred Heart, that through these messages I am truly with each of you. With your permission, I will connect with your OverSoul/Higher Self, and I will merge a facet of my Essence with yours at whatever level you are able to accommodate at this particular time. There have been and will be many blessed gatherings of STAR SEED SOULS during this momentous year. My beloved messenger recently participated in a major event of great significance in Sedona, AZ via the "air waves" of the worldwide internet. She also held a small but powerful event for members of her inner group of followers in the Sacramento, California area of the United States. For those who came from the far reaches of the planet to join with their Soul families at these events and to partake of the wisdom teachings that were offered, it was a time of harmony, joy and blending of energies. For many, it was also a time of exceptional transformation at the deepest, innermost core level. It was a time when many layers of negative energy were dissolved, energies that had been placed around the heart in times past to protect and insulate the emotional and physical bodies from the pain and suffering of the third and lower-fourth dimensions. The floodgates of the emotional body burst open as these energies were dissolved and the precious gift of Creator Fire Light was once again allowed to take up residency within the Sacred Heart / Soul chamber. It is a rare moment of recognition and a feeling of culmination when the facets of your Soul family begin to reunite and use the synergistic strength of common purpose for the greatest benefit of all. More and more members of your Soul family will be seeking you out as you lift your vibrations and send out a SOUL ECHO that they recognize. When you meet a member of your inner Soul family circle, you will know without a doubt that there is a rare and beautiful heart / Soul connection between you. When your actions are for the benefit of all, you earn the right to have a support system of like-minded, Soul-focused people. There were STAR SEED representatives from all over the world in attendance at these events, and these blessed Beings carried the SEEDS of a new awareness with them as they returned to their homes. Make no mistake; those of you who are tapping into this wondrous refined energy from the heart core of our Father/Mother God in your own locale or at other gatherings around the world are and will be gifted with an infusion of White Fire Adamantine Particles of Creator Light. As you are attuned to these higher-frequencies of Divine Light, there will be no time or space restrictions, nor barriers of any kind,for all Light Bearers who have returned to an acceptable level of harmonious frequencies of Sacred Love will begin to experience a Oneness of Spirit at many levels. At these momentous events all will commune with the masters and will receive a blessing of Divine Creator Fire Light. Indeed, into the depths of its very core, the Earth is being bathed in a glorious beam of Divine Light Substance, and every creature upon the Earth will be blessed and acknowledged. Remember, at one level or another, all are on the path of evolution and transcendence; none is being left behind. All humanity is being affected, either positively or negatively. It is up to each individual Soul to decide how much of the Divine gift of transformation they will accept and use. Initiation is now a group event, not just an attainment for special, advanced Souls. You must be willing to assist those on the path behind you in some way, so that as you are lifted up, so is all humanity. The Soul has a natural inclination toward group-consciousness. It is the Soul which seeks reunification, not the personality. Advancement on the path increases Soul consciousness and group awareness. During these times of incredible advancement in consciousness for humankind, there are many special dispensations in place for the ascension of humanity and for the coming age of en-Lighten-ment. However, each Soul must do his/her part by taking the necessary steps to attain Self-Mastery in order to tap into these, heretofore, unavailable gifts of transformation. A great multitude of STAR SEED SOULS has integrated a higher frequency mental and emotional awareness as they access new cosmic wisdom teachings. Many of you are also beginning to enjoy a sense of harmony within your innermost Self as you fine-tune and harmonize your chakra system, which is in essence seven individual memory centers within the physical body. However, some of you still have doubts and are reticent to share your insights with others, for you fear that you will make a spectacle of yourself or you believe you will be ridiculed if you try to pass on the new concepts and higher truths which are being revealed to you. There is a universal law that states you must not only be an example of your new enlightened state, but you must pass on the wisdom and understanding you have garnered so that you may move forward to the next higher frequency level. You must not try to change the minds of those on the path behind you, but teach by your example, speaking your truth at their level of understanding and telling them that there are many paths back to the Oneness of the Creator. Be patient, but strong in your convictions; compassionate, but do not get caught up in their drama, their small stories of woe; stay joyful and enthusiastic so they will begin to wonder what makes you so different. Indeed, they will notice and some day they will take heed, for you will have sown the seeds of change within their auric field and their hearts. These seeds will not be denied--they will flourish one day and burst forth and bloom into a Divine discontent, which will nudge them onto the PATH of discipleship. You are a student on the path of initiation, you are a practitioner of spiritual mastery and cocreation, and you are a teacher with a message to share. You are also preparing for a greater alignment with the many facets of your Higher Soul-Self. Beloveds, we understand there are those of you who feel you are not making much headway, and you are experiencing very few or none of the ascension symptoms that have been described in detail such as the rising of Kundalini Fire, positive life changes or more spiritual awareness. Please do not become discouraged. Those who are the STAR SEED-WAYSHOWERS have been on the PATH OF ASCENSION for many lifetimes. If this were not so, they would not be able to bring forth the refined wisdom teachings to guide humanity toward the Light, nor could they be the living examples of these higher truths. We have given many levels of spiritual teachings over the years, and many of you are trying to bypass the beginning stages of en-LIGHTEN-ment in order to catch up with those who are the leaders on the Path. You are not being left behind. Each Soul's journey is unique. Do not judge yourself by anyone else's standards or accomplishments. Stay heart-centered and Soul-focused and you will progress in the time and manner which is best for you. We give you a mandate to go by: focus on that which wells up within you as the most important issue of your life. Seek validation from within your Sacred Heart and from your Higher Self. Dedicate yourself to accomplishing that which you desire with all your energy-- physical/mental/emotional and spiritual--until it is brought to fruition. If you have doubts, start small, until you become proficient in using your latent abilities of cocreation. Sweep aside your doubts, and do not listen to others' criticism or admonitions. Follow your own inner guidance; you will not be led astray, beloveds. We have requested that our messenger share her latest experience with all of you. By doing so, she is conveying to you a heretofore secret and very ancient thought form of higher truth, and she, along with other dedicated messengers of higher truth, is helping to open the way for the next phase of the ascension process. The magnificent WHITE FIRE ANGELIC BEINGS have been waiting patiently to reestablish their connection with humankind. It is indeed a wondrous time for all of humanity, for no matter where you are on the ascension PATH, the streams of rarified Creator Light radiating from these great Beings will affect all human Beings who have opened their hearts to the higher frequencies of Divine Light. Dearest hearts, be of great courage and resolve, for you are the guiding Lights for humanity. The rarified Light frequencies and codes of ascension must flow through you and out into the world. You are honored for your dedication and steadfastness, and you are loved profoundly. I AM Archangel Michael. I wish to share an amazing experience I had during meditation in the early hours of February 25, 2012. As usual, I go outside every morning between five and six AM to pick up the morning paper from our driveway. I always spend a few minutes looking up at the sky while I do a series of infinity breaths and say my daily affirmations before coming back into my home. The main affirmation is always the same; however, I add some variation at the end, depending on what I am feeling or what I am guided to do. I always radiate love and gratitude out into the world pyramid and to our Father/Mother God, and I always feel their loving energy pour into my body to support me and guide me for the day. I usually have an hour or so by myself in the morning before my husband, Kent, gets up. I spend that time reading and meditating. At my seminars, in trying to explain how it feels when we learn to constantly remain in a Light Alpha State, or become a 'living meditation,' as Archangel Michael calls it, I say, "oftentimes, I feel as if I sit very lightly within my body whereby I have very little physical sensation. This feeling is enhanced when I am channeling Michael, for I am hardly aware of my body at all." That morning's meditation was unusual, for upon going into an Alpha State, I immediately felt an intense sensation, as if my body was a hollow tube. I could move my consciousness into different areas with ease and without feeling any physical symptoms of any kind. It was as if I were pure Spirit-consciousness. Suddenly, the word "VIVEO" came into my mind very strong and clear. Then a telepathic message came forth in the way of TRI-TON, my first master teacher, who prepared me to be a messenger for Archangel Michael. There was a gentle sense of love and a slight expansion of consciousness; however, I was very aware that I was receiving energy from a higher source. When Michael comes in, there is a great surge of energy that flows throughout my body; and depending on the magnitude of energy he is radiating to me at the time, it seems as if I must stretch my upper body to accommodate his powerful Essence. The brief telepathic message was: "I AM VIVEO, A WHITE FIRE ANGEL. It is now time, under the direction of beloved Archangel Michael, for me to once again OverLight you and assist you and the many Soul groups you are connected to in the process of Soul fragment integration. You have been told that you and many in your Soul family are 'gatherers of Souls,' and as Wayshowers and World Servers, that is the preordained role many of you are ready to assume." P.S. One other thing VIVEO conveyed to me was: "Look up the word 'vivacious,' for that is what my name means and that is the energy I will convey to you. Viveo is one of a multitude of WHITE FIRE ANGELS whose original mission was to OverLight groups of Souls who were ready to journey out into the universe as cocreator sons and daughters. They helped us to create and maintain our original ADAM - EVE KADMON LIGHT BODY. These wondrous Beings reside within the dimensional levels in which we first came into our individualized I AM consciousness. After we had refracted our Soul Essence many times and moved out into the mid-fifth dimensional frequencies, our WHITE FIRE ANGEL withdrew, for that was the lowest level they could refract themselves into in order to OverLight us. They would await the time when we would return to the required higher frequency levels so that they could once again OverLight us in order to assist us in the acceleration of our reunion with our many Soul fragments. They would also assist in the process of rebuilding our Light Body. In ancient teachings, which were often written in a way that the average person could not comprehend the deeper meaning of the messages, much was written about the time when a Soul reached a certain level of enlightenment / initiation, a great revelation would be given to the aspirants. Those teachings spoke of a Solar Angel, a sphere of radiant fire that would OverLight them. It also stated that there would be a stream of Light which would emanate from the heart center of the SOLAR ANGEL to the Sacred Heart and higher brain centers of the aspirant. This fiery link would also radiate forth to connect with the many other Souls belonging to the same SOUL GROUP. In the past, a SOLAR ANGEL would only connect with those who were of the same GOD RAY. During those ancient times there were very few Souls who reached the required level of vibrational frequency patterns necessary for ascension. 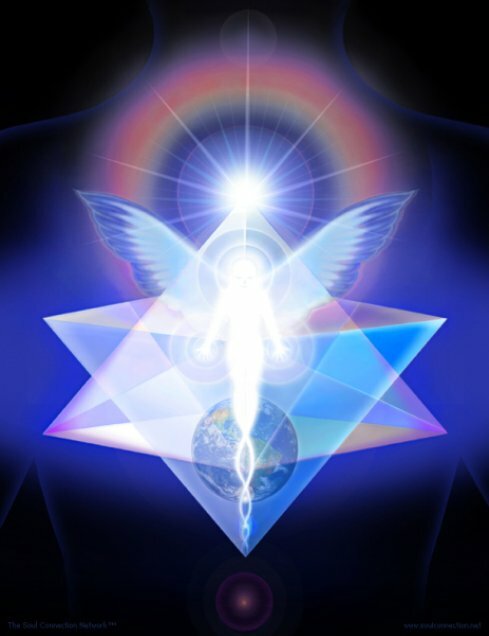 However, that has changed, this is a time of mass ascension; therefore, each SOLAR ANGEL will focus on an entire group-those who are connected to the designatedOVERSEER OF LIGHT for a particular SOUL FAMILY GROUP. In a number of past messages that Archangel Michael has given to me for people over the years, he has stated: "WE WOULD HAVE YOU KNOW THAT YOU ARE THE 'OVERSEER OF LIGHT' FOR YOUR EXTENDED HEAVENLY SOUL FAMILY. You and those like you agreed to go through the painful process of sinking into the deepest density so that 'as you are lifted up,' so are all those within your SOUL GROUP." This concept is a wonderful validation of the statement, "You are in the process of returning to unity consciousness." VIVEO told me that for those of us who are ready to accelerate the process of integrating the multiple facets of our Higher Self, his task is to adjust the frequency patterns of the incoming fragment of our Higher Self so that we are more compatible. In other words, he harmonizes our frequencies to a degree so that the integration process will not be so tumultuous. This is necessary, for in the past, the process of integrating the vibrational patterns of an OverSoul took a very long time, perhaps even several lifetimes. There is a fail-safe to this process. Those who are attuned to and are following the teachings of Archangel Michael are understandably at many levels and stages of the en-LIGHTEN-ment process. Therefore, the connection with VIVEO will still be made with all members of the group who are seriously striving to achieve a harmonious level of vibrational patterns. However, he will not send forth a fiery sphere of his Essence to OverLight you until you have reached and attuned to the required SOUL SONG FREQUENCIES of the mid-fifth dimension. Of course this wondrous gift and the accompanying rules also apply to the many different groups who are following the enlightened wisdom teachings of other great BEINGS OF LIGHT via the many dedicated messengers around the world. It has been a somewhat uncomfortable process for me to become accustomed to revealing some of the important steps I have taken, the wondrous gifts I have been given, along with the tests, trials and advances I have experienced on the path of ascension. For those of us who have studied the ancient teachings and who also have many of the rules of those times firmly ingrained within our consciousness, it is difficult to reveal and share some of the details of our personal journey, both positive and negative. As many of you are aware, before these times of mass ascension, the wisdom teachings and the ascension process were totally kept in secret from the masses. They were called "occult teachings," which means they were only made available to the few initiates and disciples on the PATH. However, those rules have changed, for the Divine Blueprint for the coming Golden Age has been modified and updated. Therefore, it has been mandated that those of us who have assumed the role and responsibility of becoming a messenger for the great Beings of Light will convey to those who are "ready to listen and take heed" all of the important aspects of our journey, along with the wondrous, advanced wisdom teachings we are given to convey to the world. During our June seminar in Roseville, California, I told the participants about VIVEO and the role he will now play for us in our ascension process. Everyone was so fascinated about this latest development and some were almost overwhelmed. I became quite emotional when I told them the details. Many of the participants said they could feel VIVEO'S powerful energy and they are very excited about what the future holds. VIVEO projects a very powerful masculine Essence. Although all of the angelic Beings are androgynous, they may choose to radiate either the masculine or feminine qualities of our Father/Mother God.